CoCo Couture is located in the heart of LKN and carries unique collections that are trendy and eye catching. Designs from Frank Lyman, Joseph Ribkoff, Alberto Makali and many more are housed at this fashion house. CoCo's closet is filled with fabulous finds.....and we love to BLOG about it! Calling all fashionistas! Come BLOG with us! If you all are anything like me, you're a last minute planner and the holidays tend to sneak up on you. Valentines day is just sixteen days away! Life gets busy and figuring out what to wear is hard! CoCo Couture is here to save you from the stress and worry that this holiday can bring! We even have a concierge system, all you have to do is call us with what you're looking for, your size, and we will have outfits ready for your arrival! You ARE royalty to us, and we want to serve you in any way we can! Now to the outfit ideas for that special date night with your sweetheart or a night out with your best girlfriends because you're an independent woman who doesn't need a man! Price: $62.30, a 30% savings! Now ladies, jumpsuits are SO in and they are SO versatile! Throw on a Brighton necklace and studs (we have a variety here) and a pair of strappy heels and you are SET for a fun filled evening! Who doesn't LOVE a little black dress!? You will be standing out in the crowd in this gorgeous Frank Lyman dress! Dress it up with a pair of long earrings and some heels, you will be all set to go! Sizes are limited, we currently have size 12 and size 14, and when they are gone- they will not be restocked! This top paired with the raw edge of the jeans gives off a sassy yet elegant vibe. 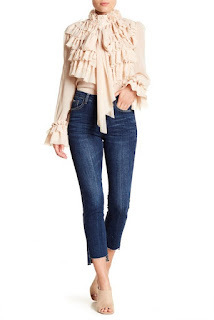 This top can be worn with SO many things, from being dressed down with these jeans to throwing on a pair of black dress pants to transform into a perfect work staple! And yes, the top DOES come with the necklace, and it is SUCH a gorgeous necklace. This is the perfect outfit that has limitless opportunities to transform into whatever occasion you are dressing for! The outfits described above are only a few of the many clothing options located at CoCo Couture! From evening dresses to jeans to Brighton Jewelry, CoCo has it all! We also offer complimentary wine tastings as well as gift wrapping if you find something a you or a friend need or even better- a gift to yourself from yourself for a rainy day! Cold Shoulders are in... and we don't mean ignoring!